Many house Republicans are calling for the resignation of Eric Greitens in Missouri and they are correct. It's not that Greitens had an affair but that he blackmailed and at the very least intimidated the woman he had an affair with, which are crimes. 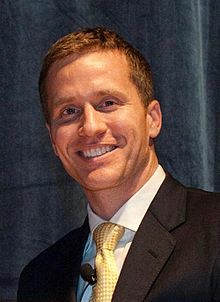 Greitens has been in the grooming circle for president for a while now; as a Missouri voter I can tell you how Missourians are largely against him but he had lots of help from out of state interests getting this job. We don't want him and now his own party doesn't want him! One of the big complaints right now is that Hollywood is holding a higher standard than our government and when someone is discovered to be abusing his or her power, he or she loses work as a result. If that were the case for our government, of course, our president would be impeached. It's time to start holding our government to the same standards as our media. Greitens needs to resign. Today.